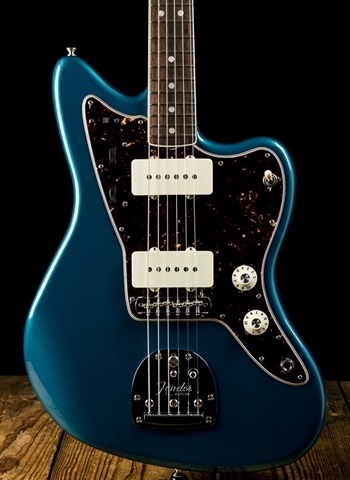 The Fender Jazzmaster has been for decades one of the most versatile and playable instruments that players everywhere are drawn to for its amazing style and tonal character. The Fender Jazzmaster is typically made with soapbar pickups. Despite being single-coil pickups, soapbar pickups are reverse-wound and thus have a hum-cancelling effect in the middle position. Therefore it has a wonderful combination of glassy clean sounds and crunchy riff sounds. 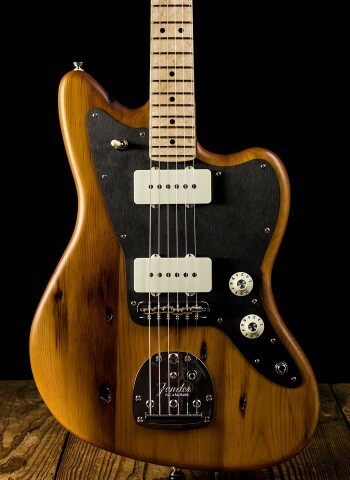 The Jazzmaster is known for having a much more mellow sound than a Stratocaster or telecaster, though it was ironically not used by jazz musicians very often, although rock, surf, funk, and many other types of guitarists have gone on to love its versatility and playability. For any information on the Fender Jazzmaster Contact us today at N Stuff Music for one of the best selections of Fender Jazzmaster guitars in the industry today. 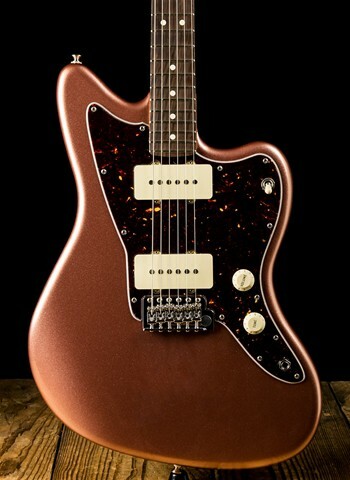 The Fender Jazzmaster spans the entire gamut of the Fender line in terms of price starting with the Squier Jazzmaster, Standard Jazzmaster, Classic Jazzmaster, Artist Jazzmaster, American Vintage Jazzmaster, and finally the American Professional Jazzmaster. This is one of the amazing things about Fender, they provide an uncanny ability for players of all background and financial status the ability to play a Jazzmaster guitar with durability and reliability. One of the most important things to look at with the Jazzmaster is the incredible list of players who play a Jazzmaster, so let's take a look. Nels Cline of Wilco, Jessica Dobson, Elvis Costello, Joe Pass, J Mascis of Dinosaur Jr., Thurston Moore and Lee Rinaldo of Sonic Youth, Kevin Shields of My Bloody Valentine, Tom Verlaine and Richard Lloyd of Television, and countless other players. These players all demand the best out of a guitar in terms of performance, tone, intonation, reliability, and quality. 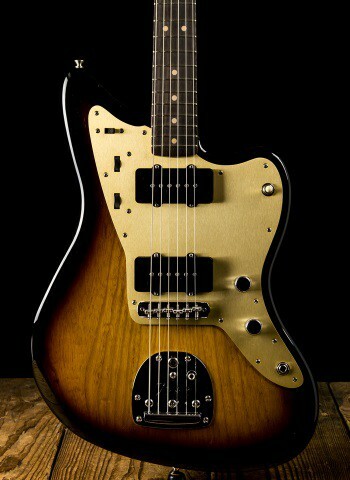 This is what brings them to make the Jazzmaster a choice instrument. Whether it's Nels Cline playing jazzy solos on a Wilco tune or Kevin Shields riffing for My Bloody Valentine the Fender Jazzmaster can handle the circumstance that it is in. 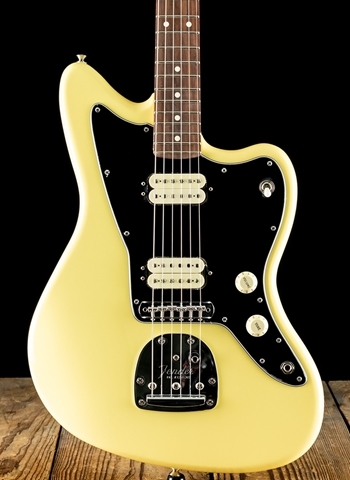 The extra-long tremolo arm that is a notable feature of the Fender Jazzmaster has made it a sought after guitar by surf guitarists for its ability to manipulate the pitch and sound of the guitar in the same way that has influenced so many surf guitar sounds. There is no single more iconic brand in the history of the guitar than Fender guitars. Fenders are the brand that has set the standard for all other guitars to be compared to. 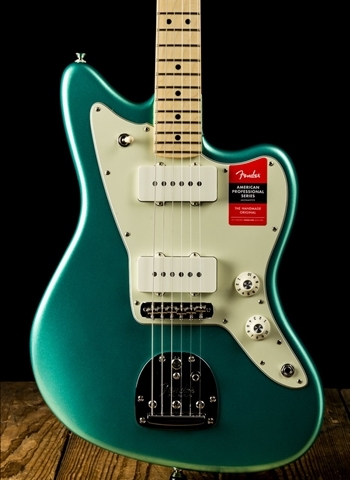 Fender has never been known to limit themselves, thus production of the Jazzmaster, Jaguar, HSS strats, Squier, acoustic guitars, mustang, duo-sonic, and many other guitars as Fender seems to never quit reinventing their possibilities. At N Stuff Music we are proudly one of the largest dealers of Fender guitars in the region and our innovative website has allowed us to become one of the premier dealers of Fender instruments in the United States. 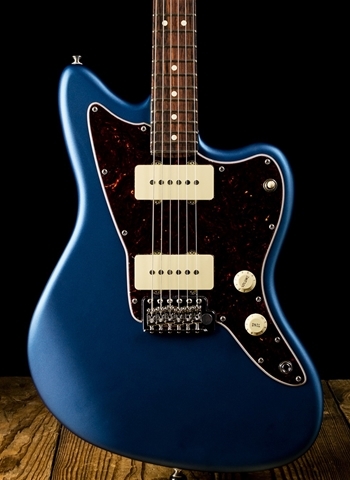 The Fender Jazzmaster has carried one of the most exciting and innovative positions in the market of Fender guitars.